This bass excerpt from Mussorgsky's Pictures at an Exhibition has been edited by Lawrence Hurst, former principal bassist with the Dallas Symphony Orchestra and Professor and chair of the String Department at Indiana University School of Music since 1986. Hurst's bowings, fingerings and other editorial markings have been added throughout the score. Pictures at an Exhibition is a piano suite composed by Russian composer Modest Mussorgsky in 1874. It is his most famous piano work and has become both a virtuoso piano showpiece as well as a frequently orchestrated and arranged composition. The work is a tribute to the painter and architect Viktor Hartmann, whom Mussorgsky was good friends with. Hartmann died from an aneurysm in 1873. Mussorgsky was inspired to compose Pictures at an Exhibition after influential critic Vladimir Stasov helped to organize an exhibition of over 400 Hartmann works in the Academy of Fine Arts in Saint Petersburg, including works from Mussorgsky's own personal collection. The music of Pictures at an Exhibition depicts an imaginary tour of an art collection, with titles of individual movements alluding to works by Hartmann. The suite opens up with the famous "Promenade," in which Mussorgsky depicts himself moving through the exhibition at a leisurely then brisk pace, reflecting on one of the works and the life of his departed friend. This is followed by 10 movements, each featuring a distinct character and as a whole providing a variety of invention. Visual motives find vivid aural form: clocks, bells, chants, feathers, flames, climb and descent. The first two movements of the suite – one grand, one grotesque – find mirrored counterparts, and apotheoses, at the end. The suite musically illustrates a journey that begins at an art exhibition, but the line between observer and observed vanishes by the time we reach movement 8, "The Catacombs," when the journey takes on a different character. Yet, even in the face of all of this variety, each movement traces its roots back to the opening of the Promenade. 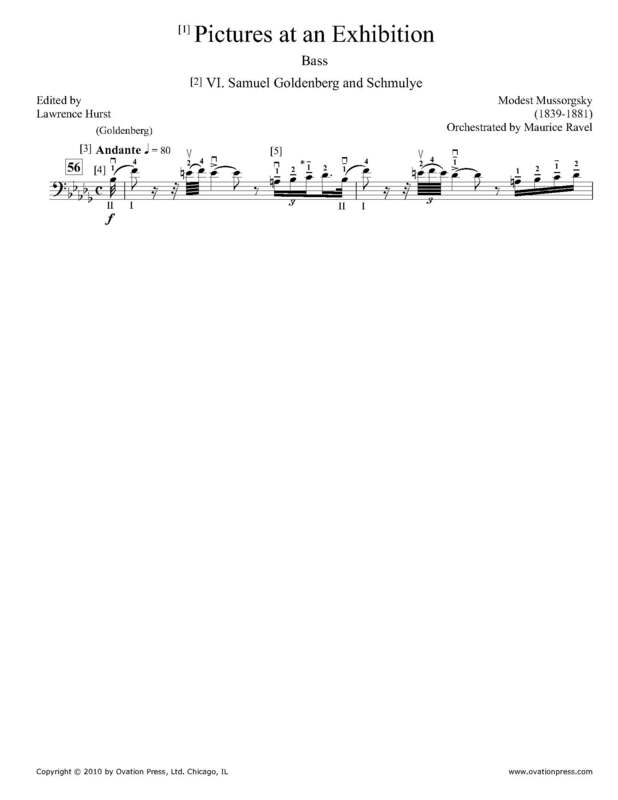 Download and print the score today to gain access to expertly edited Mussorgsky Pictures at an Exhibition bass fingerings and bowings from Lawrence Hurst! Please note: There is one page of music encompassing the bass solo from Samuel Goldenberg and Schmulye and one page of commentary and instruction. This score is only available for purchase by customers living in the USA and Canada. Mussorgsky wrote Pictures in 1874 after being inspired by a visit to a memorial exhibition for Russian artist Victor Hartmann, who died in 1873. The ten pictures were originally for piano, but have been transcribed for orchestra by many notable composers, among them Ravel, whose rendition is the one most often used today. This solo is edited in acomprehensive and detailed manner. Larry Hurst’s insightful performance suggestions are enclosed with this music.